Although you’re nestled inside your cozy home, for some reason you feel a little bit like a caged bird. Here’s why: When your home was built or improved for greater energy efficiency, it was sealed up tight. Unfortunately, this took away your fresh-air freedom. Or did it? What if our team at Swanton Energy Services told you that we could help you bring fresh, outdoor air inside your home without opening a single window or door? Believe it or not, it’s true. Our home ventilation systems will get your home in gear for a crisper indoor environment while still retaining its airtight efficiency. Nowadays, homes are sealed tight for energy efficiency. On one wing (or hand if that’s your thing), this prevents air from leaking in and out of your home. But on the other, it steers your space toward poor air recirculation. So why should this issue be on your radar? Because the tighter your home is sealed, the more caged off it is from taking in fresh air. This traps dust, allergens and other dangerous contaminants inside, giving them free rein to peck away at your indoor air quality. With the average person spending 90 percent of his or her time indoors, you’re constantly breathing dirty, contaminant-filled, stale air. It’s no wonder your desire for fresh air is at new heights. But all of this chatter about ventilation leads to an important question: Which system is right for you? Even though both systems bring fresh air into your home in an energy-efficient and cost-effective way and recover 80 percent of the heating and cooling energy of the exchanged air, only one will fit your home’s bill. Let’s take a closer look at the two systems. HRVs make stale air fly the coop, while bringing fresh air inside. During this process, they recover energy from the air that is being expelled. Therefore, HRVs are the energy-efficient solution for removing harmful pollutants from your home and improving your indoor air quality. With dividing walls that are sealed against humidity, if your home experiences high humidity levels in the winter, then you need an HRV system as your co-pilot. ERVs do more than eliminate harmful contaminants from your space and bring fresh air inside. With this system, you’ll land a well-balanced humidity level, too. So, if your home struggles with the inconvenience of varying humidity extremes from season to season, then it needs this system as its wingman. In the summer, humidity levels are high. Well, an ERV’s walls contain a special material (known as a desiccant) that is able to absorb humidity. This gives your cooling system the boost it needs to remove excess moisture from your home’s air. Under an ERV’s wings, your cooling system is able to effortlessly take your comfort to new heights while leaving high energy bills on the ground. During the winter, you can stop dry air from taking over your home by installing an ERV. You see, when this system detects dry air, it pumps in moisture before returning the air to your home. This leads to a better-balanced humidity level. Plus, since dry air makes your space feel colder than it actually is, the moisture an ERV adds will foster a difference in comfort you can feel. Which System Will Send Your Serenity Soaring Higher? Because of their similarity, it can be tricky to decide which system is right for you. So, before you take to the skies, glimpse at these key factors. How many people reside in your roost? Larger, active families tend to generate more humidity. An HRV is a better fit for them. Smaller families typically don’t create as much humidity, resulting in drier air. For them, the ERV, which can add moisture to air, is often a better fit. What are the dimensions of your nest? 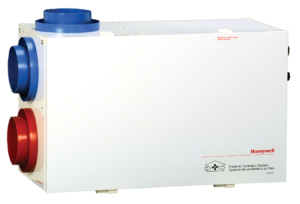 HRV units are best suited for small or medium-sized homes, where humidity can quickly accumulate. ERV units better serve larger spaces, where air tends to be drier. The tighter the space, the more humidity it retains. For extremely airtight spaces, an HRV is the best choice. Your heating system is a huge deciding factor! Even though your heating system keeps you nestled up during frigid weather, it also heavily influences the humidity level in your home. For wood-heated environments, air tends to be drier, making ERVs a “nest”cessity. That’s because this system can add moisture to your home’s air, which will guide you toward a healthier humidity level for a difference you can feel. Ready to Buckle up for Fresher Air? There’s no way around it: An ERV or HRV system must be installed flawlessly. That’s because these systems only work effectively if they’re perfectly calibrated. This is important for keeping incoming and outgoing airflow balanced. Well, journeying toward fresher indoor air is a breeze with Swanton. Backed up by three decades of expertise, our team will steer you toward the right ventilation system and then bring you in for a smooth landing with our superior installation skills. When you’re ready for takeoff, fill out our online form or call us at 732-335-6731 today! Want to breathe fresh air from the comfort of your couch? Well, now you can with Honeywell’s TrueFRESH Ventilation System. This systems works to draw heat or cold from the air to deliver fresh air during winter, spring, summer and fall. Our expert service and personalized care is the chirpof the town!